This pie uses the standard pâte brisée that most of the Elsens’ other pies use; I’ve already covered that recipe in full detail so won’t repeat it here. I’ve also covered the construction of lattice-topped fruit pies with another example from this same cookbook, which is why this is just a “quick take” and not a full walkthrough. The mise en place is pretty standard for the Elsens’ fruit pies: lots of fruit, a baking apple (to be peeled and grated), arrowroot, fresh lemon juice, and sugar. The spice here is allspice, along with a couple dashes of Angostura bitters, and of course the aforementioned lavender oil — just a couple of drops, it’s very strong and goes a long, long way. 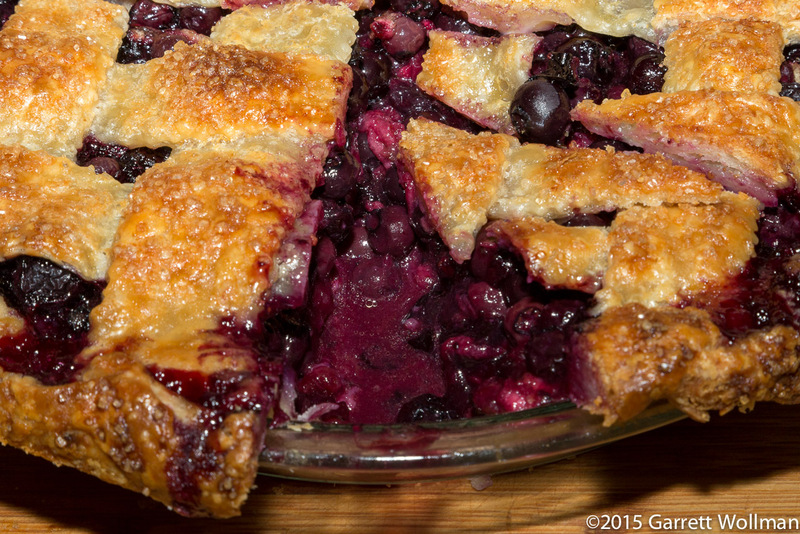 There are two whole pounds of blueberries in this pie! All of the ingredients are mixed together, with some of the blueberries being crushed by hand — if the Test Kitchen people got a hold of this recipe, I’m sure they would have cooked down half of the blueberries, driving off excess water to make a jam. The lattice top is painted with egg wash and then sprinkled with demerara sugar for browning. Like any double-crust pie, there’s no opportunity for blind baking the bottom crust, since it has to get crimped together with the top crust after the filling goes it; to make up for this, the Elsens say to preheat a half-sheet pan on the bottom rack of the oven at 425°F (220°C), and after 20 minutes of cooking, reduce the temperature to 375°F (190°C) so the top doesn’t burn. And there’s the result. My pies — at least the ones I bake using the Elsens’ high-butter pie crust recipe — always tend to leak a lot of butter into the pan, and the crimp on this one didn’t quite stay up, so some of the filling leaked as well, thus the paper towels to keep the mess from dripping through the cooling rack and onto my countertop. I took a slice for myself after the pie had completely cooled. As you can see, the filling was quite runny, but most of the blueberries had remained intact — I’m not sure if that meant I should have crushed more of them, or if this recipe is just expected to be that way. I would note that the top crust shown in the cookbook is not a lattice, like I made, but a fancier pattern that covers less of the filling, perhaps allowing more evaporation — but the instructions say you can even use a solid top. This was my slice. 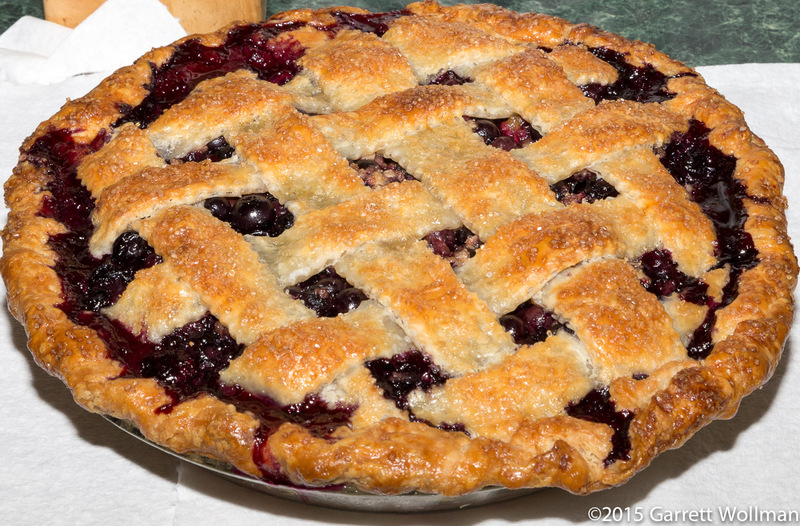 The pastry was a bit weak where the lattice met the crimped edge, so the sides had a tendency to fall away, but it was still very tasty, with a noticeable (but not unpleasant) lavender scent and good blueberry flavor. I brought the rest of the pie into work (I took some time off from my vacation to attend a group lunch and our weekly staff meeting), and everyone who had some loved it — and they particularly liked the fact that there were still a lot of whole(ish) blueberries in the filling, rather than blueberry jam. As usual, they loved the crust; I’ve always had better response to this crust than my own opinion of it. 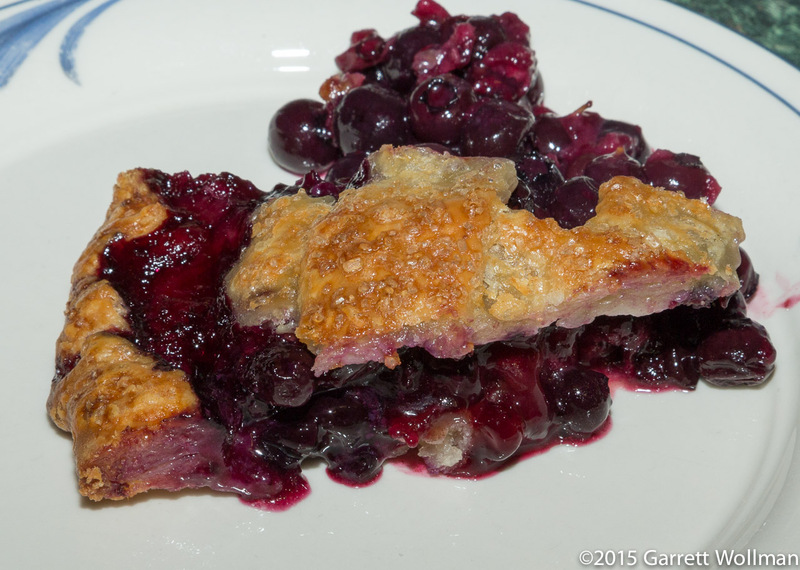 The recipe headnote says “8 to 10” servings, but I made this pie as 12 servings. Some of my coworkers took rather more than that, though! 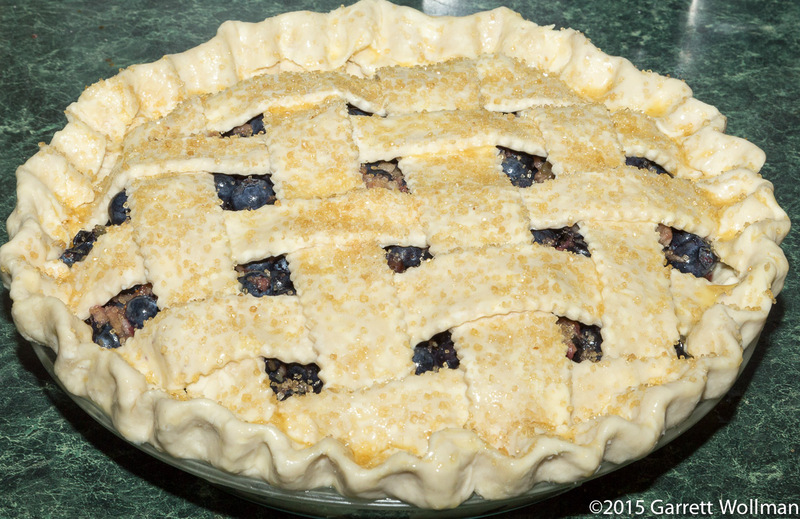 This entry was posted in Food and tagged blueberries, Four & Twenty Blackbirds, fruit pie, lavender, pie, recipe. Bookmark the permalink.